I LOVE THIS MOVIE!! Yeah, its about a people(Vikings) that are intolerant about the Dragons and through the "weird" kid they learn that the Dragons are not as bad as they thought. Mostly because the Dragons have to feed this huge Dragon, and if they don't they get eaten. So, the story itself isn't original and is based off a kids book, but I absolutely loved it! I thought it was better than Avatar. I know I will be called a Heretic for that one, but seriously, Avatar was cool because, like Tolkien, James Cameron creates great worlds and encyclopedia's and such, but in all honesty is was kind of boring. And a lot of it didn't make sense and although it was pretty, it just wasn't entertaining. So, back to the Dragon movie. I love Dragons, always have. And I have a soft spot for stories about creatures that are feared but not understood, and a child that is different comes along and changes everything. Its funny how the Vikings had Scottish accents, I'm not sure Vikings had Scottish accents, but I guess it makes sense. The other thing is they kept praying to Odin or something. Did Vikings actually worship Odin? I have no idea. The movie was funny, it kept you interested, entertained, and yet had a happy good message. 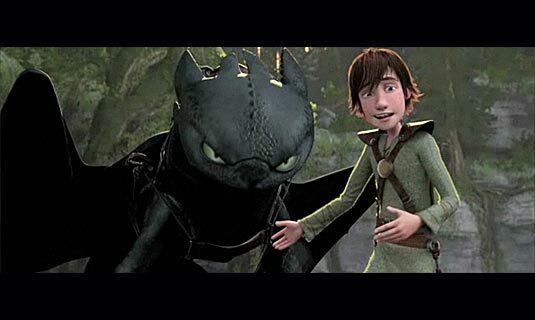 I love how Hiccup had to work really hard to get Toothless to trust him, it took time to train him, etc. This creates a deeper relationship between both of them. Not even in Avatar where they were supposed to be "one with the planet", "connected to the animals" did you actually see any of the Navi or Jake? have a really close and deep relationship with any of the animals? No. All they did was stick their weird hair in the animals and there you go, supposedly they have a deep bond! Whala! That just isn't as sincere to me as actually having to work at a bond like that. And even if the Navi's brains were capable of having their brain cells work fast enough to melt their brains with the animals, Jake would've been like a toddler trying to walk when connecting with the animals. You don't just fuse brains with another creature and expect to be all one organism instantly. Oh, and another thing. The characters in the Dragon movie are more lovable than those in Avatar, I could care less about anyone in the Avatar movie, but you get attached to Toothless and Hiccup, and even some of the bit characters have admiring traits. Anyway, How To Train Your Dragon is definitely going in our collection, and I'll probably read the book too. I'd be more excited to show this movie off to my guests than Avatar. Take your kids to see it, adults see it, its great for everyone! !